Have you noticed since the '05 contract all major snowstorms fall on the weekend???? I had no idea that Randi and Klein included witchcraft into the contract. 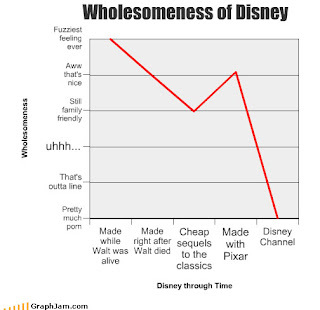 Check out the graph on the left, reflecting the varying wholesomeness of Disney, freshly stolen from Miss Cellania. I knew there was something suspicious about that Hannah Montana. Note to NY teachers--study it carefully in case it appears on the January English Regents exam.